A consistent cause of a non healing wound is the MMP factory creating enzymes which inhibit healing in otherwise healthy patients. Collagen is the most common and effective MMP controller and directs these enzymes away from the wound bed and up into the collagen layer. 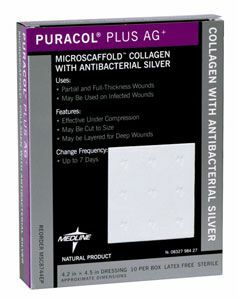 While most dressings only regulate moisture content (an Alginate drying a wet wound or a Hydrogel wetting a dry wound) Collagen actively interferes with the MMP process. Please Contact Us for pricing and additional information.